Kardos, born in Budapest, Hungary(1946-2018) studied under the guidance of renowned art teacher Barcyhal and was featured all over Hungary as a young artist. Kardos later traveled to study and explore art in Sweeden, Italy, Spain, South America and The United States where he settled in Ramsey, NY. Janos Kardos is reguarded as a unique and distinct figure in the international art community where his paintings are recognized and appreciated by critics and collectors alike. "My goal is to reach a clear and unbiased communication with the spectators and have them experience the joy of life". Griffith Art Gallery has enjoyed collecting, framing and showing Mr. Kardos's original one of a kind paintings to fine art collectors for many years. The paintings available in the gallery are all originals acrylic paintings on stretched canvas. 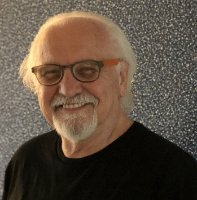 Janos Kardos, age 72, passed away peacefully in his home on November 30, 2018. Janos was an accomplised artist, committed to living a life that he loved-one of adventure, happiness, and self expression. He approached every moment of every day with joy and passion, and sought to develop authentic relationships with all those around him usually with a strong cup of cofee in his outstretched hand.